CS:GO is a very popular game developed by turtle rock studios and valve. It's a big step forward from CS:Source. CS:GO is almost like a modern day CS 1.6, except it's run by people who have no idea what they're doing and/or don't care about anything other than the money it brings in. The game features a matchmaking system and pairs up a group of 5 people against another group of 5 people based on their ranks. Your performance in these matches only plays a small role in determining your rank. If you queue up with your friends and you're a higher rank than them and despite being the top on the scoreboard, you'll still derank if you lose. It's as though Valve thinks if you're a higher rank than the other team you should be able to ace (kill every enemy by yourself) every single round. 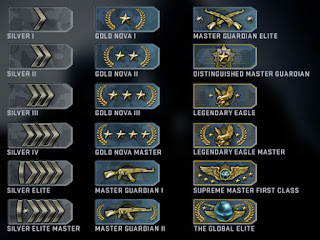 This would make sense if you're a global elite and you end up facing silvers, but if you're supreme master first class and you queue up with your friends that are, say, master guardian II to distinguished master guardian there's no way you can possibly get an ace every single round. It just doesn't happen. Silver's are essentially new to the game, they cannot move around very easily. They cannot aim very easily. Thus, they are easy to kill. They are a lot like bots or computers playing the game. But players in master guardian I and up aren't so easy to kill. They can move around, they can aim, and usually they can get kills. It doesn't matter how good you are, you can't take on an entire team of somewhat skilled players on your own. If you don't queue up with your friends and play solo it's going to be difficult to rank up. Your rank ups are going to be the result of luck, not skill. That's what makes this ranking system so stupid. Again, it doesn't matter how good you are, if you don't win you do not rank up. Some people on the Internet say they've ranked up after a loss, but this isn't because of their performance, it's because they were supposed to rank up a previous match but the system failed to notify them. So they rank up the next match regardless of its outcome. When I first started playing this game I got placed in gold nova master after 10 wins. I actually should have been placed much higher, at DMG, but I was playing with my silver friend and ended up facing gold nova players. Regardless, I quickly ranked up to MG1 then MG2, then MGE, and then DMG. It wasn't because of my performance, but because I was able to win matches one after another. Then, I got to legendary eagle, then legendary eagle master, and finally supreme master first class. I can safely say that DMG and above are all pretty much identical in skill levels. There is only a slight difference between a supreme and a DMG player. Usually, the supreme will have somewhat better aim and spray control, but this isn't always the case. Players at supreme on average didn't really know more smokes than players at DMG and above, nor did they know more pop flashes, nor did they know about ninja spots. I have recently deranked from supreme to LEM due to a losing streak and I did not notice any changes in skill level. I got another losing streak and further deranked to LE. Again, there's not much difference in skill levels. Then finally, you'd play against players who always get an instant headshot the moment they peak you, yet they don't know any smokes nor pop flashes and they even have terrible movement. In this case, it's almost always hackers. In official competitive matches, voice communications are now team-only in warmup and half-time, allowing players to discuss player roles and strategies. The true reason they disabled it is to prevent players from raging. For example, if one team has say won only 1 round while the other team has won 14 rounds, the former team is going to rage at the other during halftime. Essentially, Valve wanted to make the game less toxic. Funny, they still use a ranking system that's based on wins only. What do you think is going to make someone rage? I know there's lots of players that would rage at their team if they were losing, especially if that player was on a winning streak and close to ranking up. In short, don't waste your time playing CS:GO's matchmaking. Not only are the ranks based on wins and not skill, but it's filled with hackers. Save your sanity, and get ESEA. code works is too hard.keep going on! Great article! It was really interesting to read!